The Richmond International Airport decided to give TreeDiaper® a try in 2016, and now they’re back for more! If you’re like most people, going to the airport is a guaranteed source of stress. The bustling crowds, uncomfortable security checks, worries of missed flights, cramped seating, and swarms of rolling suitcases begging to be tripped over probably come to mind. Beautiful landscaping isn’t one of your first thoughts. With a whole airport to manage, who has the time – or the money – to spend on trees? That’s where TreeDiaper® comes in. Ordinary methods of irrigation are tricky in an environment like this. Bringing a watering truck into an area with 24-hour activity is a hassle for everyone involved, not to mention it is very expensive. So, when trees near the Richmond International Airport Flight School died, the landscaping company, James River Nursery, knew they needed a new solution. They decided to give TreeDiaper® a chance: a choice that made all the difference! James River Nursery started with just 25 TreeDiapers® in winter, 2016. Dead trees were replaced in December when these 25 TreeDiapers® were installed and covered with mulch as a test run. TreeDiaper® is not harmed by harsh weather; on the contrary, our product helps protect tree roots from extreme winter temperatures. The trees were alive and well that coming spring of 2017, thrived through the next summer, fall, winter, and spring, and continue to do so today! 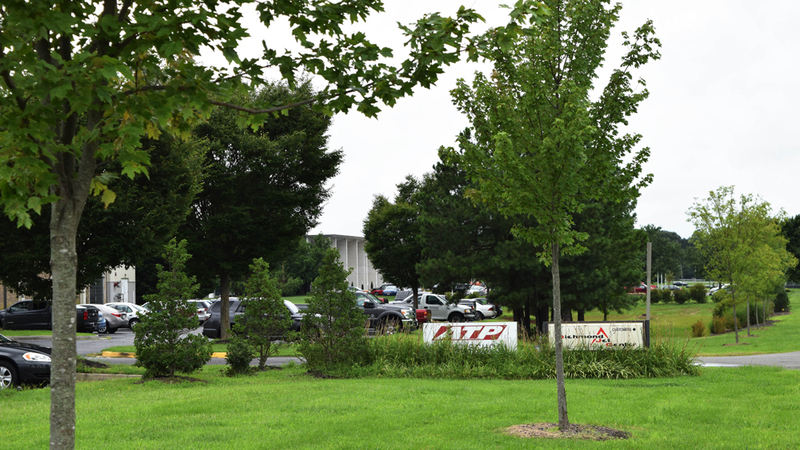 The previously hopeless trees outside Richmond International Airport Flight School have survived for more than a year with a little help from TreeDiaper®. 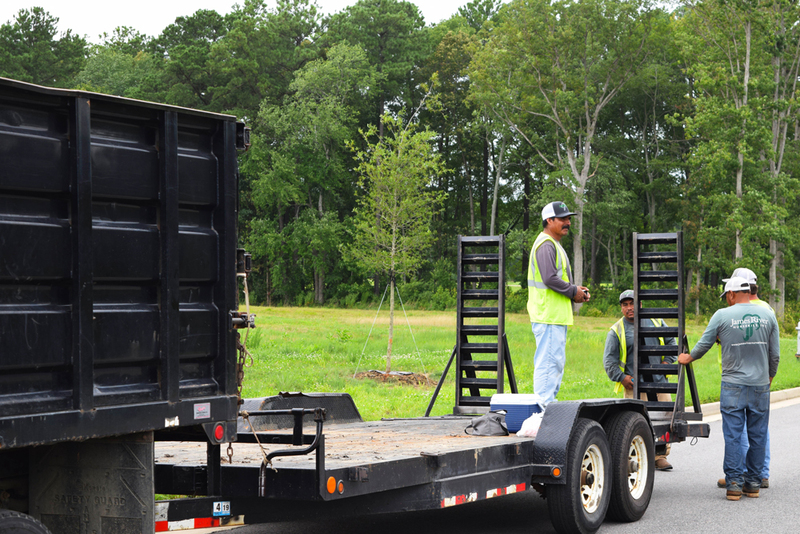 The trial went so well that James River Nursery is now working on a larger-scale project where 250 TreeDiapers® are in the process of being installed. Last week when we drove down to check out the progress, we were lucky enough to meet the landscapers at James River Nursery, who were installing TreeDiapers® that day around 250 young trees. 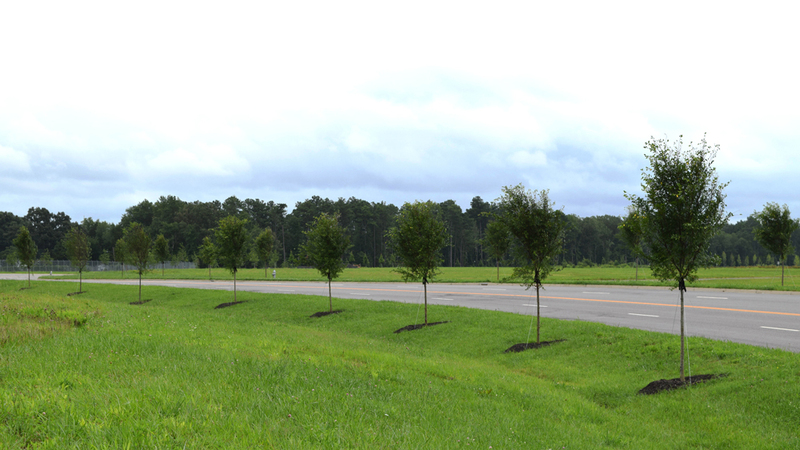 Thanks to TreeDiaper®, James River Nursery will be able to save time on watering these trees in the future. Instead of watering the trees a couple times every week in the summer, now they only need to send out a crew to monitor the tree growth periodically. 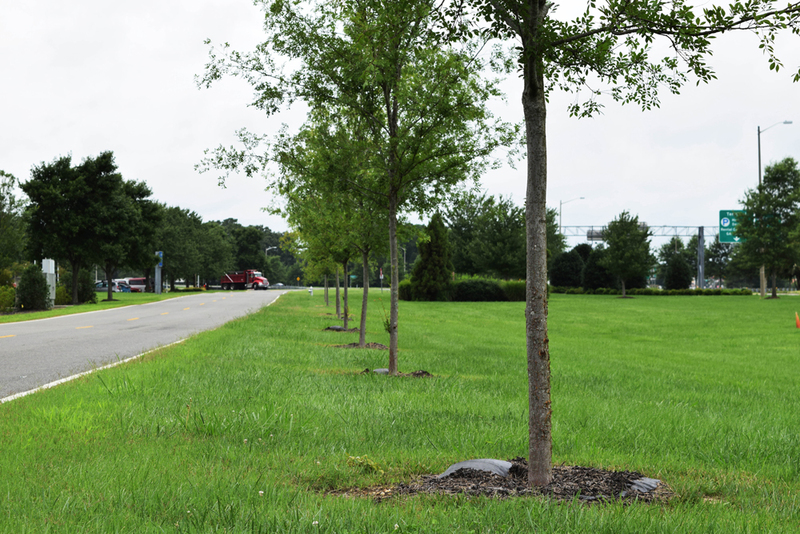 TreeDiaper® will help Richmond International Airport save their trees, conserve water and spend less money on maintenance. Maybe adding some more green to the airport landscape will reduce all that stress! Stay tuned for updates on Richmond International Airport. Save plants, save water, save labor, and save the planet!